SeaScape offers stunning unobstructed views of the Caribbean Sea. 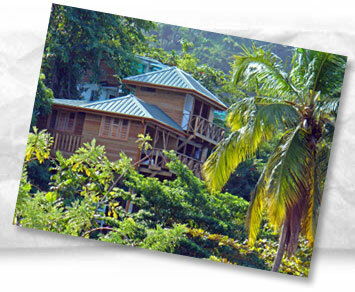 It is a hand crafted wooden holiday accommodation that sits directly above the beach at Heavenly Bay in the little fishing village of Castara, Tobago. This quality retreat was designed in an effort to give full appreciation for this stunning beach front location. The effect is a light, airy, place where delicate and colorful birds often fly through the room, where the soothing sound of the calm surf below seems to be coming from all around you and where every room offers unobstructed views of fiery sunsets slipping into the Caribbean sea. This unique vacation rental was built on the former site of the famous Cliff Hanger guesthouse. Cliff Hanger was once recognized by British Air Magazine readers as being one of the top 52 hideaways in the world. In keeping with this tradition, SeaScape is a place where the natural beauty of the sea, beach and tropical rainforest can be appreciated from comfortable, self-catering, all en-suite vacation apartments. Seascape's design meets the needs of independent travelers who want to escape the all-inclusive resorts yet still desire a comfortable, high quality retreat. We offer well-equipped accommodations without the intrusion of television, climate controls, or telephones to invade your getaway. However, free Wifi internet access is available throughout SeaScape and mobile phones are available for loan. Our local staff can help with recommendations for buying groceries, hiring a car and booking excursions among other things. If you are looking for a comfortable Tobago holiday set in a stunning “off the beaten track” location, we would be delighted to share our little paradise with you!